The front passenger front airbag must be switched off when securing a rear-facing child seat to the front passenger seat. Open the door on the front passenger side. Use the open key bit to turn the key-operated switch to the position. Close the door on the front passenger side. When the ignition is switched on, the PASSENGER AIR BAG indicator lamp will light up steadily in the dash panel . The PASSENGER AIR BAG indicator lamp lights up in the dash panel and disappears after approximately 60 seconds . Check that the PASSENGER AIR BAG indicator lamp in the dash panel does not light up when the ignition is switched on . A disabled front passenger front airbag is identified only when the PASSENGER AIR BAG indicator lamp is displayed in the dash panel ( lights up yellow continuously) . If the indicator lamp in the dash panel is not lit up steadily, or if it lights up at the same time as indicator lamp in the instrument cluster, do not attach any child restraint system to the front passenger seat for safety reasons. 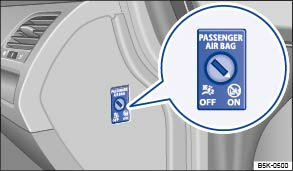 The front passenger front airbag may trigger during an accident. The front passenger front airbag should only be switched off in exceptional circumstances. To prevent damage to the airbag system, only switch the front passenger front airbag on and off when the ignition is switched off. It is the driver's responsibility to ensure that the key-operated switch is set to the correct position. Only switch the front passenger front airbag off if, in exceptional circumstances, a child seat has to be attached to the front passenger seat. Switch the front passenger front airbag back on again as soon as the child seat on the front passenger seat is no longer being used.